What are the pancreatic endocrine and neuroendocrine glands? The pancreas is an organ located deep in the abdomen that has two main functions. It produces digestive enzymes (exocrine pancreas) and also has islets of specialised endocrine cells "islet cells" scattered throughout it (endocrine pancreas). These cells secrete important hormones such as insulin, glucagon and gastrin. In addition, clusters of endocrine cells can be found in most organs of the body, especially those associated with an embryological organ know as the "neural crest". Any of these cells can develop special tumours called "neuroendocrine" tumours. The commonest example is the carcinoid tumour which develops in the gastrointestinal tract or the lung. What are the indications for pancreatic endocrine or neuroendocrine surgery? Local symptoms from the tumour mass or metastases from a cancer. 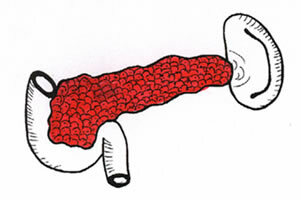 Overproduction of hormones causing one of a number of clinical syndromes: insulin producing tumours cause low blood sugar; glucagon producing tumours cause diabetes and skin changes; gastrin producing tumours produce stomach ulcers; carcinoid tumours produce a sweating, flushing and changes in the heart. How is pancreatic endocrine or neuroendocrine surgery usually done? As these tumours are usually located deep in the abdomen they are done under general anaesthesia through an abdominal incision. A skin incision is made and the underlying muscles divided. The tumour is located and removed, with great care being taken not to injure nearby structures such as the exocrine pancreas and spleen. Occasionally part of the intestine needs to be opened or removed. The muscles are then put together again and the skin incision is closed with sutures that will either absorb or be removed soon after your operation. What are the risks and complications of pancreatic endocrine or neuroendocrine surgery? Bleeding may occur during the operation as these tumours are near large arteries and veins. This may lead to the need for a blood transfusion. Fluids and enzymes can leak from the pancreas and form collections or may drain to the skin. Any open surgical incision in the abdomen may be at risk of developing a hernia long after the operation.